Hello friends! 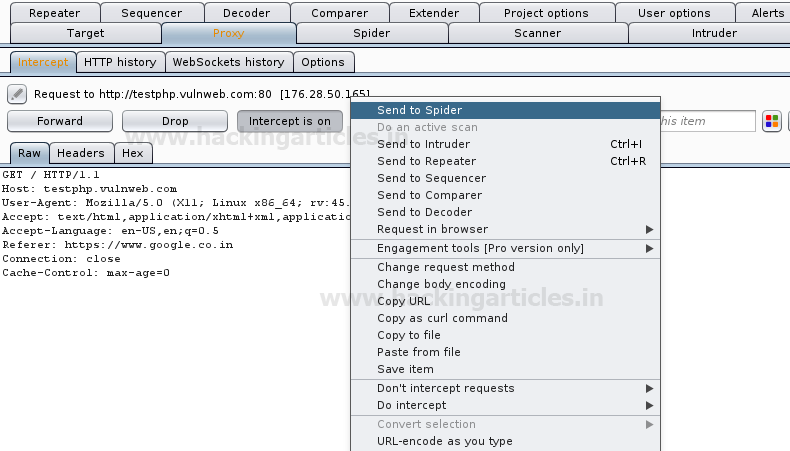 Today we are doing web penetration testing using burp suite spider which very rapidly crawl entire web application and dump the formation of targeted web site. First attacker needs to configure browser and burp proxy to work properly, www.tetphp.vulnweb.com will my targetd web site for enumeration. 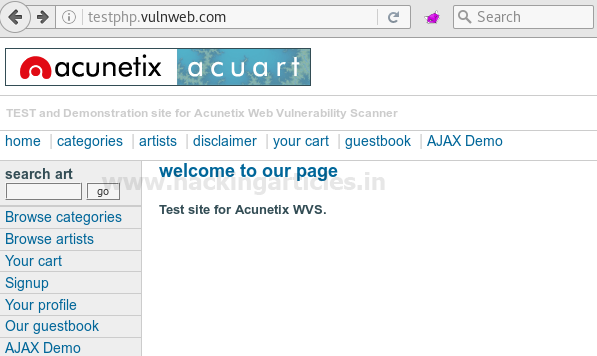 Form given below screenshot you can see currently there is no targeted website inside site map of burp suite. To add your targeted web site inside it you need to fetch the http request send by browser to web application server, using intercept option of proxy tab. Click on proxy tab and turn on intercept in order to catch http request. Now choose spider tab for further step, here you will find two sub categories control tab and option. · Spider is paused / running - This toggle button is used to start and stop the Spider. While the Spider is stopped it will not make any requests of its own, although it will continue to process responses generated via Burp Proxy (if passive spidering is enabled), and any newly-discovered items that are within the spidering scope will be queued to be requested if the Spider is restarted. · Clear queues - If you want to reprioritize your work, you can completely clear the currently queued items, so that other items can be added to the queue. Note that the cleared items may be re-queued if they remain in-scope and the Spider's parser encounters new links to the items. The best way to handle spidering scope is normally using the suite-wide target scope, and by default the Spider will use that scope. This tab contains options for the basic crawler settings, passive spidering, form submission , application login, the Spider engine, and HTTP request headers . · Request any unrequested URLs already present within the branch. · Submit any discovered forms whose action URLs lay within the branch. · Re-request any items in the branch that previously returned 304 status codes, to retrieve fresh (uncached) copies of the application's responses. · Parse all content retrieved to identify new URLs and forms. · Recursively repeat these steps as new content is discovered. · Continue spidering all in-scope areas until no new content is discovered. Hence you can see the targeted website has been added inside the site map as a new scope for web crawling. Choose spider this host option by making right click on selected URL which automatically start web crawling. When you click on preferred target site map further content which has been discover by spider will get added inside it as shown in given image below. 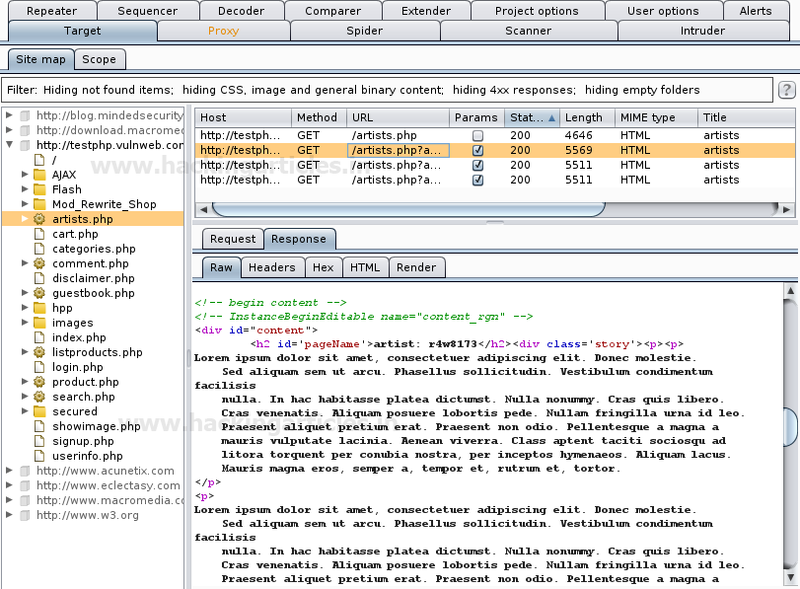 Form screenshot you can see its dump all items of web site even by throwing request and response of host.